There was a time when office requirements meant a seat, a desk, a photocopy machine and a telephone. Those days are long past. Offices of today need to look good, be comfortable and inspire a happy vibe. 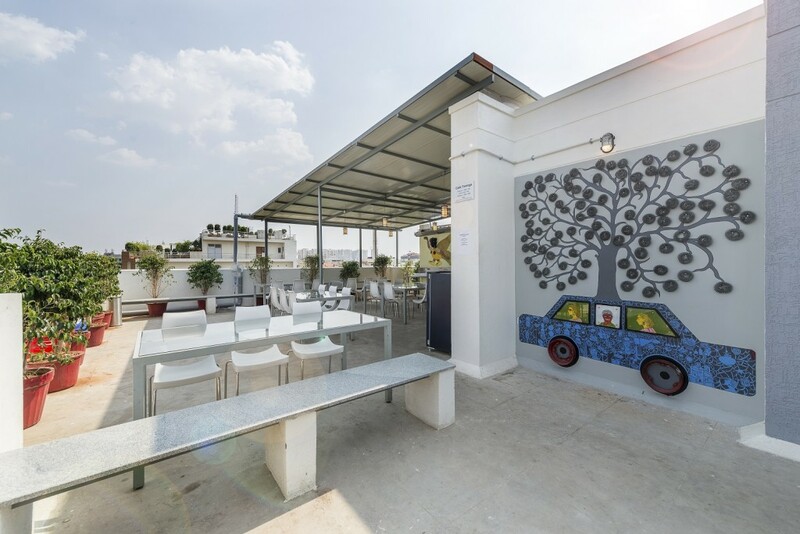 Sure enough, Indian offices, like their foreign counterparts are also catching up, and pulling out all the stops to turn a boring office into a creative, fun space. And while contemporary furniture and state of the art accessories are one way, more often than not, the walls are cruelly left out. Not at these offices though. 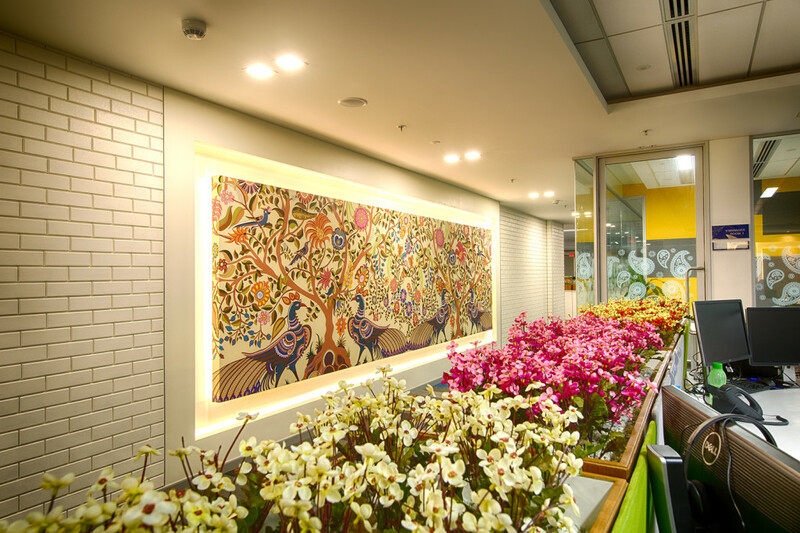 Along with other ways to do up the office, they have turned walls into focal points with beautiful wall murals, paintings and other art. In fact, in a way, how interesting the walls are at an office can define how fun that office really is. After all, the writing’s on the wall. 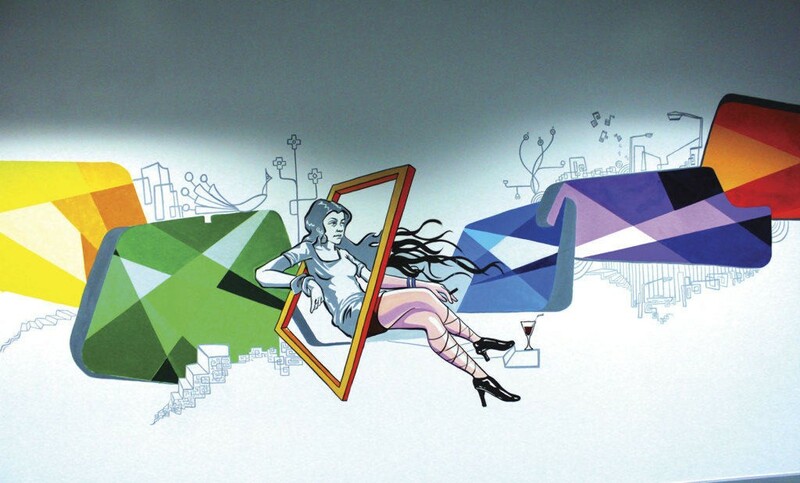 Here’s a look at 21 examples of stunning wall art at offices in India. 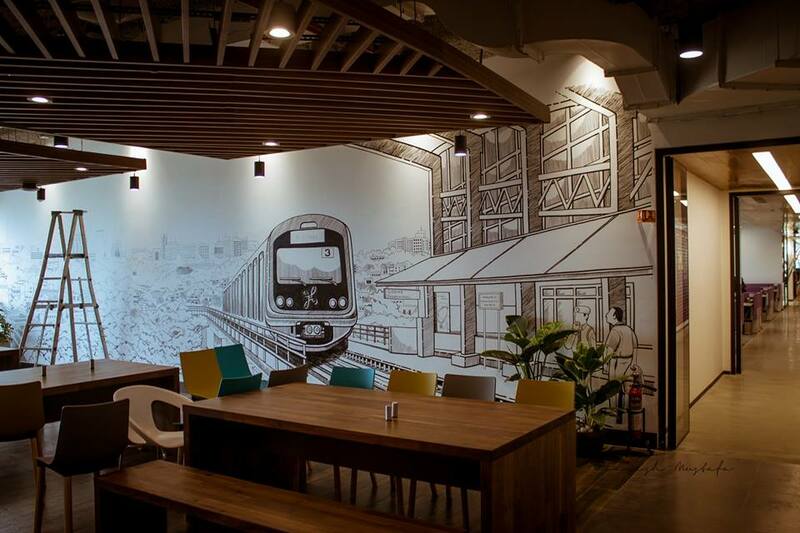 The cafe lounge area is given a railway station touch with an all-wall mural. Check out the full office here. 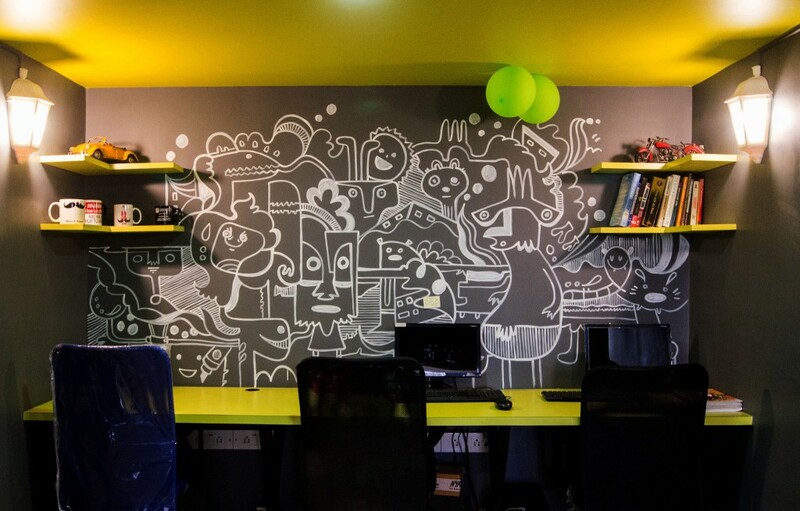 The Vistaprint office in Mumbai is like a giant sketchbook of wall art with almost every wall having been done up with a mural, especially of a psychedelic nature. 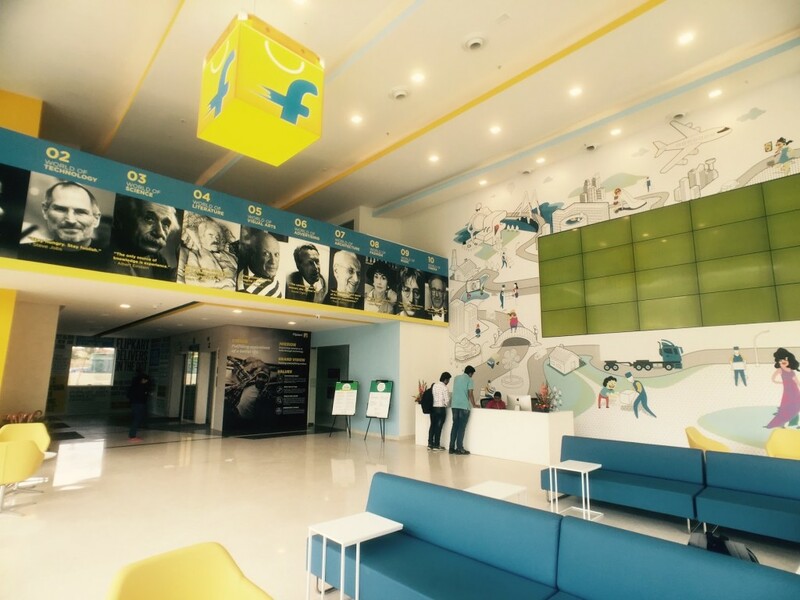 This swanky Flipkart head office in Bangalore features a prominent mural wall right at the reception, serving as a good harbinger for the rest of the office. Snapdeal’s new office in Gurgaon boasts of many pretty and fun props, including some fun wall art. 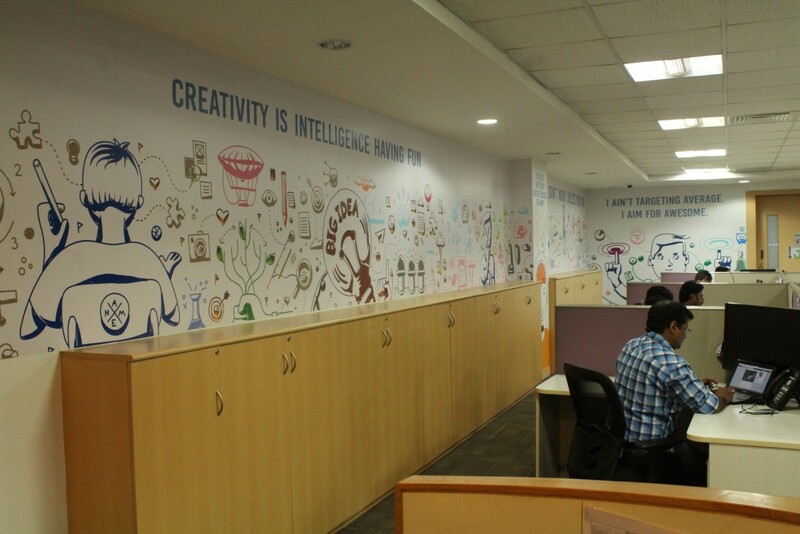 The Freecharge office in Indiranagar Bangalore has this fun wall scribbled with toons and abstract art. The little meeting rooms have colourful murals and quotes (As seen in this photo of Kunal Shah) by eminent personalities from history. The SutraHR office turned coworking space is one of the prettiest offices around, and has this chalkboard styled wall art, featuring some detailed doodling. The Pegasytems office in Hyderabad, amongst other things, features these lovely traditional Madhubani paintings lending a classy and yet funky touch to the office. Comic Con is synonymous with pop culture and great artwork so it’s unsurprisingly their office walls speak every bit of the Comic Con cult. 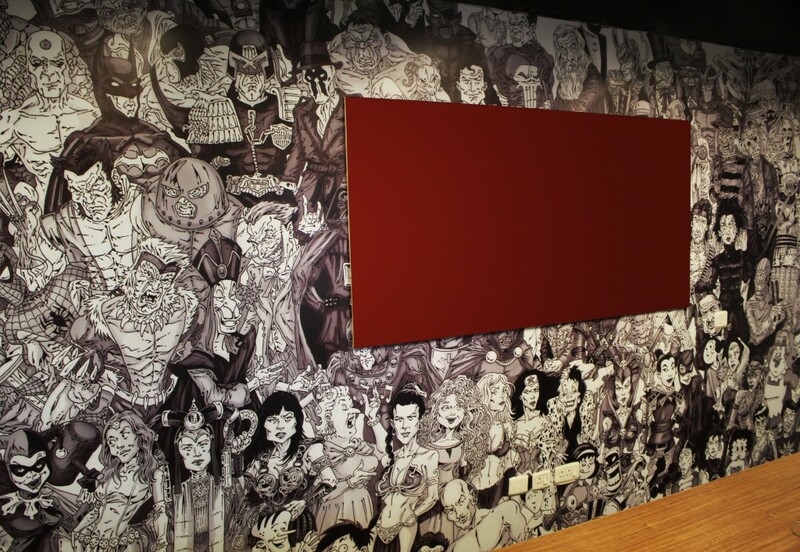 Check out this beautifully detailed wall full of characters from your favourite comic books, making it one of our favourites on this list. The brand Chumbak is all about design and colours. 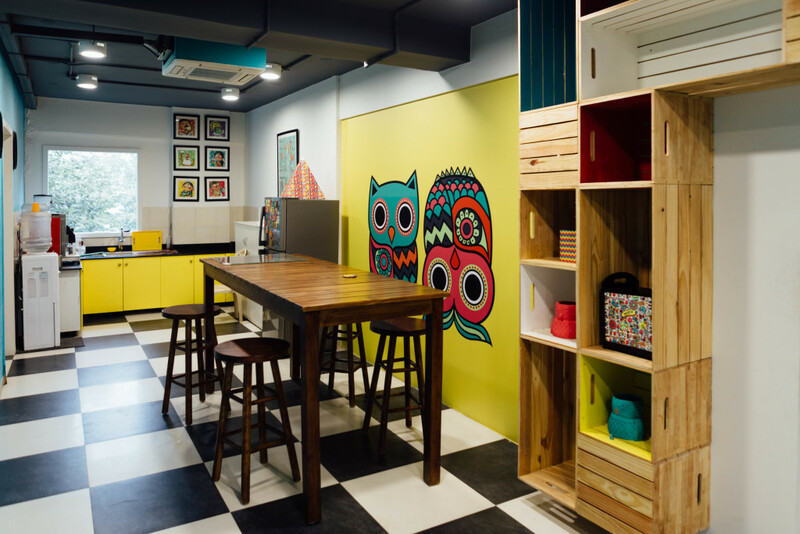 Unsurprisingly, the Chumbak office flaunts the signature owls on a bright yellow wall. 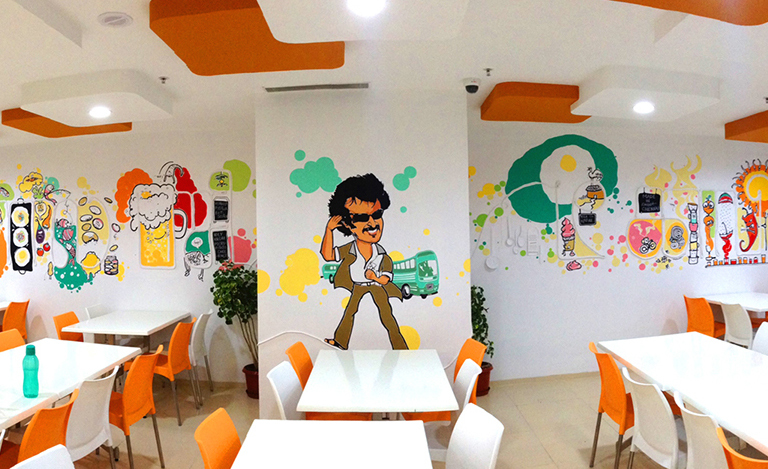 This wall at the cafeteria in the Freshdesk office in Chennai flaunts beautiful motifs, along with a painting of local demigod star Rajnikant. There are many more beautiful walls in this office. check out full office here. 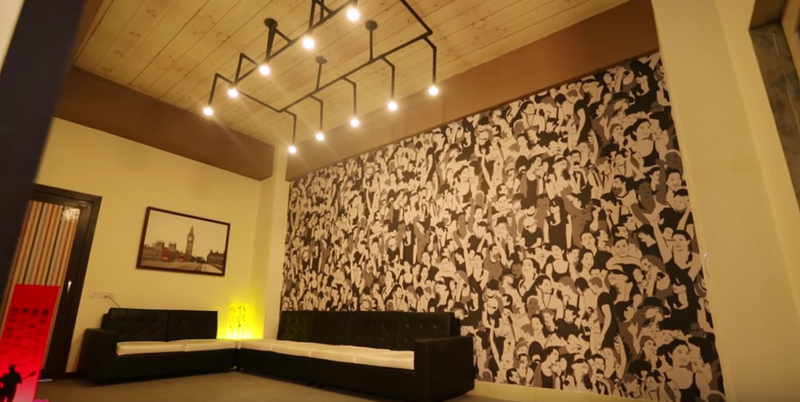 The recreation room at the Razorpay office in Bangalore has all the walls covered with pop art, sports figures and framed art, lending it a pop culture feel. 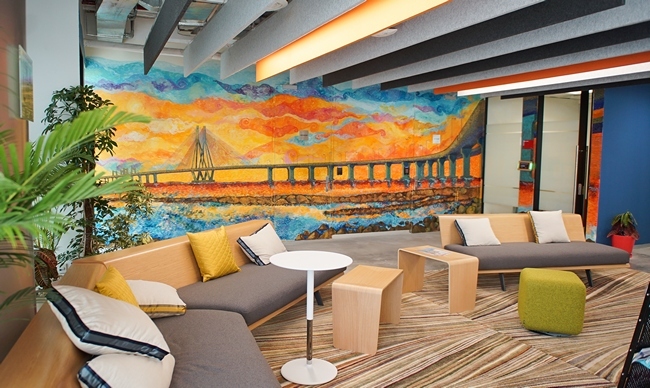 Treebo doesn’t limit its wall art to within its office, but also takes it on the terrace, with this combination of mural + sculpture art. This entire wall is covered in pop art faces, making for a focal background for the UK-themed reception area. At this office, the wall art makes it way inside the work areas, making for some happy cubicle walls, with motivational messages. check out the office here. 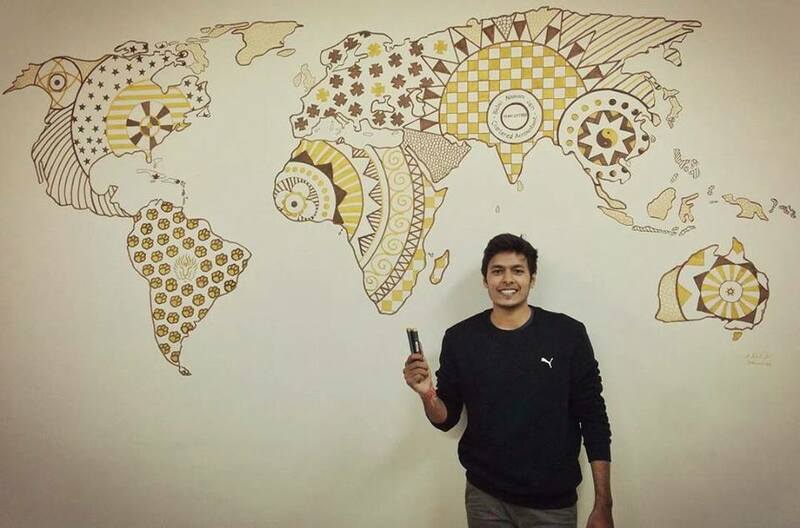 This coworking space in Mumbai is full of wall art, including this artistic world map. 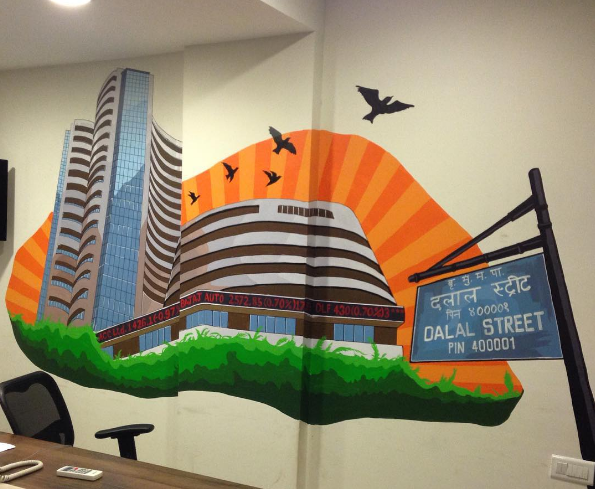 This lovely mural depicting the stock exchange Mumbai has its pride of place at the stock broking and financial startup, Raah Financials, Bangalore. 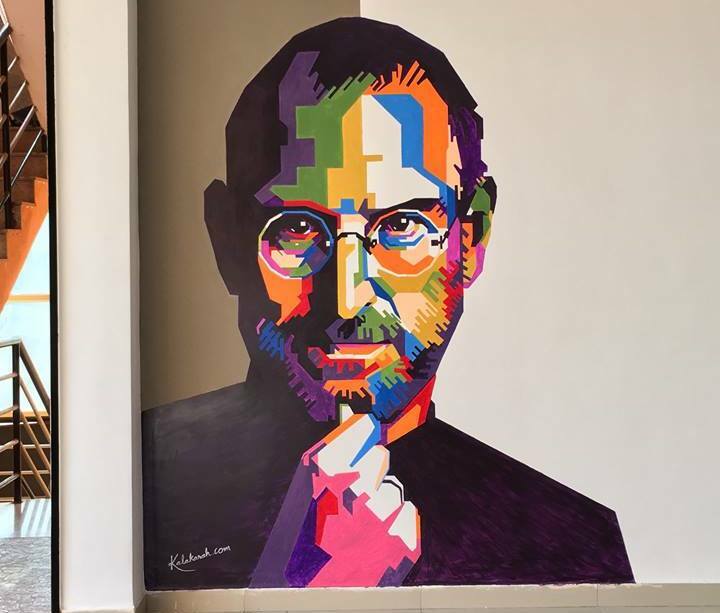 This wall in an unassuming iPhone service centre in Marathalli, Bangalore pops out with this amazing Steve Jobs mural. 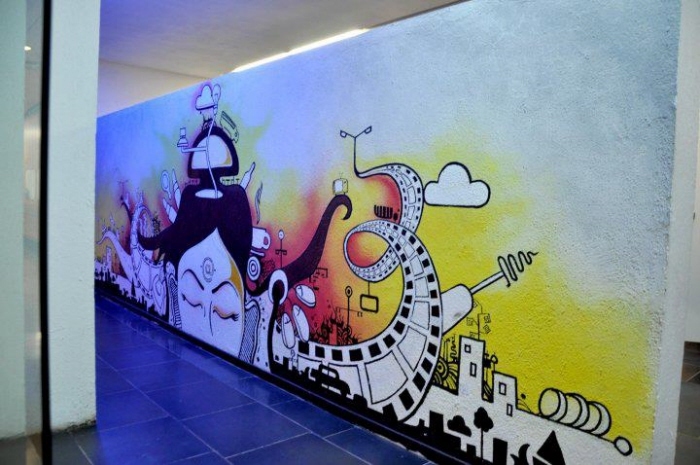 This modern mural with a graffiti inspiration was done by the Bangalore based artist group Kalakarah. Google is no stranger to beautiful and swanky offices. 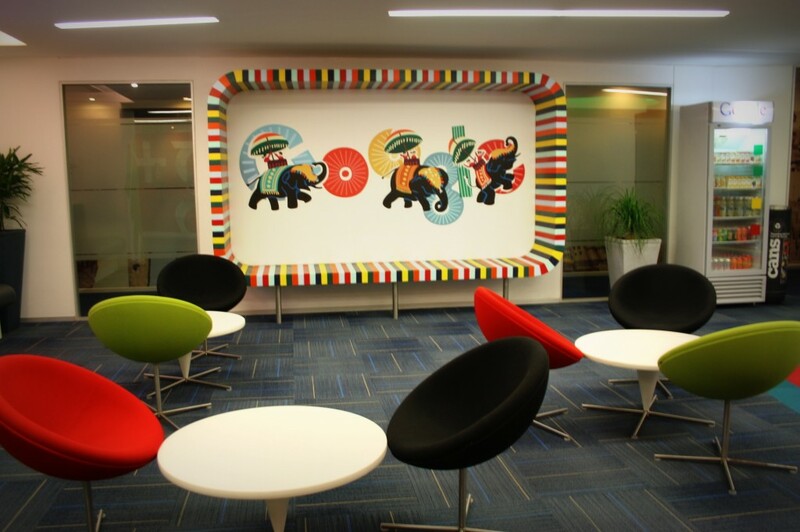 This wall in the reception area of Google’s Gurgaon office is an Indian spin on a Google doodle. 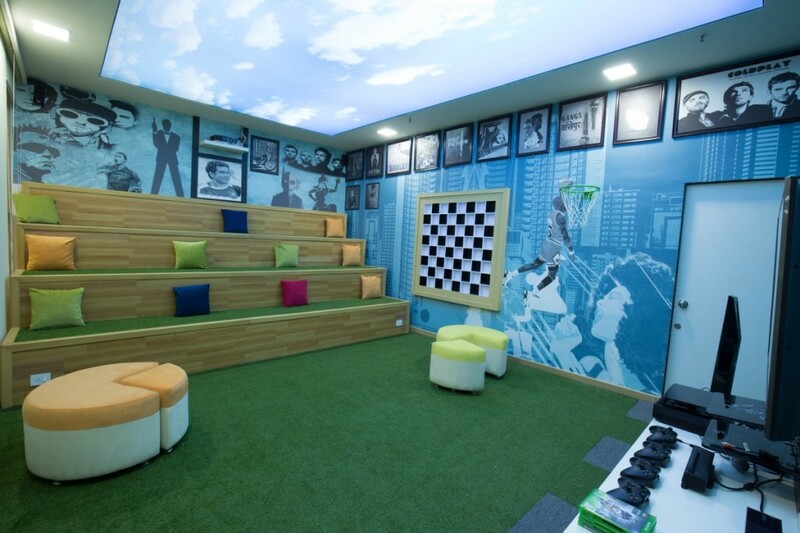 Similarly, Google Hyderabad office also sports many beautiful walls. 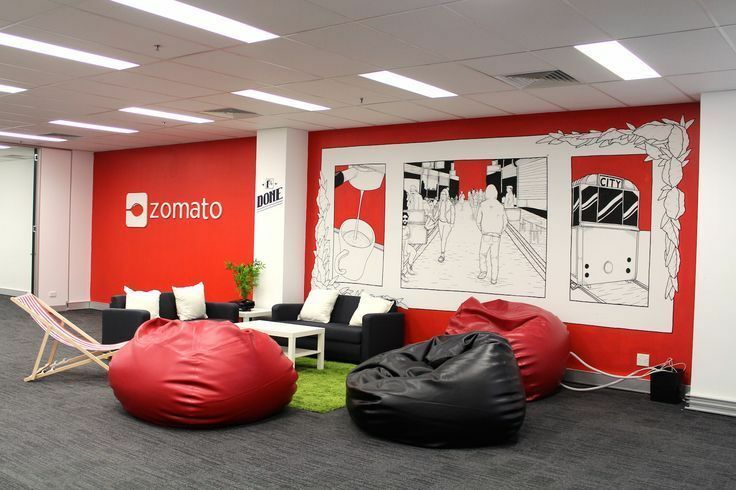 Zomato is known for its vibrant, young and fun work culture, and surely enough its wall reflect the same. This wall against the signature red depicts a day in life of an average foodie. For a startup that majors in fashion and style, it’s but obvious that its office makes a style statement too. 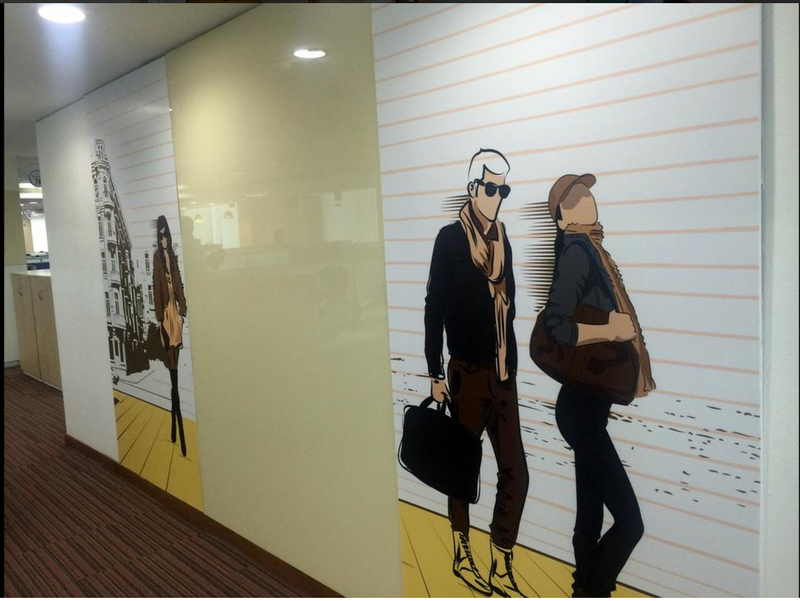 Myntra takes it a notch higher with literally every wall in the office being full of graffiti, murals and fun pop art. And finally who better than Facebook to know about fun walls, a company that turned virtual walls into hubs of social networking. At Facebook offices around the globe, walls sport real wall (or now timeline) looks. 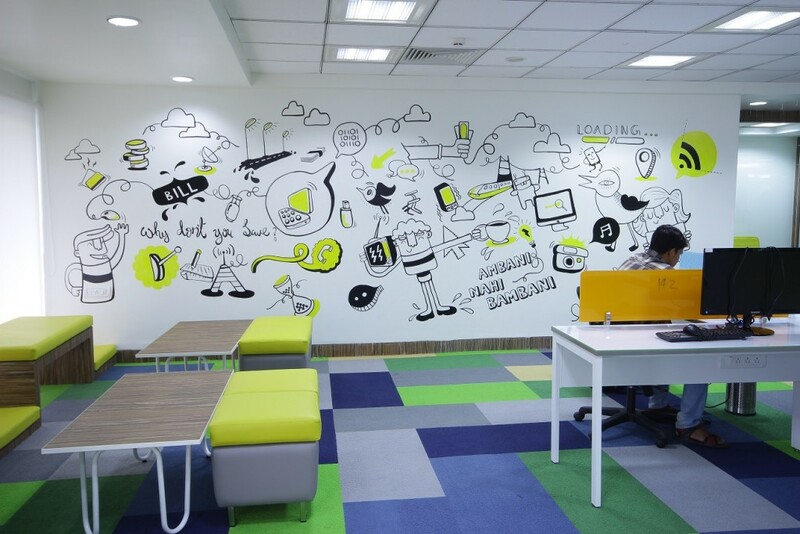 However in the newly opened Mumbai office, the walls have a personality of their own with beautifully detailed doodles and murals.